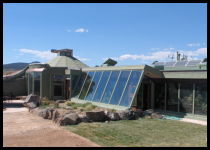 Jan 2005 – March 2005 – Shoot at New Mexico legislator and Earthship community. April 2005 – May 2005 – Shoot Andaman Islands post Tsunami. March 2006 – Garbage Warrior wins best pitch at Hot Docs Toronto. April 2006 – ITVS International, Sundance Channel and Documentary channel confirm co production funding. Nov 2006 – Fine Cut complete – Commence music score. March 2007 – Post production – London. I met Mike Reynolds in May 2003, when he and his crew arrived in the UK on a two-week visit to build a prototype Earthship house in my home town, Brighton. I was inspired by Mike’s apocalyptic view of the future, and by the urgent means by which he and his crew were preparing for it. Every bottle or tyre is an invaluable building material and when the cities fail and crumble, it’s fair game to go in and mine out the goods. He is one of few people I have met who has a realistic outlook on the true destiny of our modern civilization: a man who clearly sees that fast radical social change is our only way out of a serious meltdown. Mike’s philosophies are derived from nature and its direct connection with the inner self, brought to a reality in his 35 years of work with the use of simple physics and biology. It is a reality where action speaks louder than lip service, and Mike is both an architect and an activist in the trenches on the front line with the workers. I was inspired; there was no turning back. I started filming the UK build with the aim it would be a one-off 40 minute television piece, but I was soon to realise that Mike and his desert communities had an epic story to tell. In November 2003 I took a small crew to New Mexico on a small budget. Once I had analysed the footage from the first shoot, it was clear that the story was a political one that was not over; in fact I’d arrived in the middle of it. The communities were still partially shut down and Mike still had unfinished business with the authorities. I knew then I was in for the long haul, and that somewhere the story would shift from a retrospective to a present day observational drama. We could have approached the story in many ways at this point; a science of how the buildings worked or did not, an investigate piece on the pro’s and cons of Reynolds social and architectural experiments, or a study of life within an idealist community. But we wanted to achieve a strong enough narrative to take the film to cinema – to get the notion of off grid living to as wide an audience as possible. Garbage Warrior evolved into more of an activist/ advocate film, concentrating on the wider political story. Screen South UK, who were helping to support the film. Rachel had the skills and experience I was lacking to find funding and broader interest. A year later we had approvals from 5 international broadcasters, raising enough money to complete editing and post production. We always wanted to make a movie that entertained and offered high production values. But how could we capture this in an epic feature film style with strong characters and observational footage on a localized level, telling the big story (global catastrophe, climate change). We needed the real life drama of the struggle with the retrospective back story to tie it all in: for me this was the real challenge. Well 3 years and 250 hours of footage later, with much advice taken from my producer and editor, we finally got to the edit. Working that much material into a narrative structure involved our editor Phil Reynolds cutting retrospective interviews into the observational footage. This proved an invaluable narrative tool, and avoided scripted voice-over, which would have toned down the passion of our main character. Phil’s expertise and creativity won through. We always wanted the film to have a wide range of music. A combo of hick style banjo and slide guitar for the back story; desert style fusion of pulp fiction guitar and big Morricone sounds for the court room drama; and Apocalypse Now Doors-style guitar with Indian tunes for the Tsunami. Composer Patrick Wilson had to rise to the challenge of composing almost the entire music for the film, taking nearly four months of intensive work, such a crucial part in taking this documentary to a cinematic level.